As we head into the last few weeks of 2017, it is time to update the Disney World Crowd Calendar for the next 365 days. 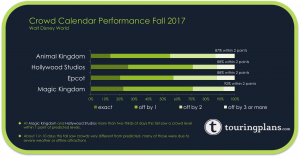 We are fairly happy with the performance of the Crowd Calendar this fall. Two-thirds of the days saw a crowd level within 1 index point of predicted levels. Even if you are only loosely following a touring plan a difference of one index level is virtually unnoticeable. When the calendar missed the mark by three or more levels it was usually due to severe weather or a higher than normal offline rate of key attractions. When major attractions go offline, wait times go up and the calendar shows a larger crowd than expected. Crowd predictions for Animal Kingdom and Epcot missed a little more often than Magic Kingdom and Hollywood Studios. Fall 2017 was closer to an average fall than 2016. Last year we saw some very large crowds on days when we expected the crowds to be moderate. 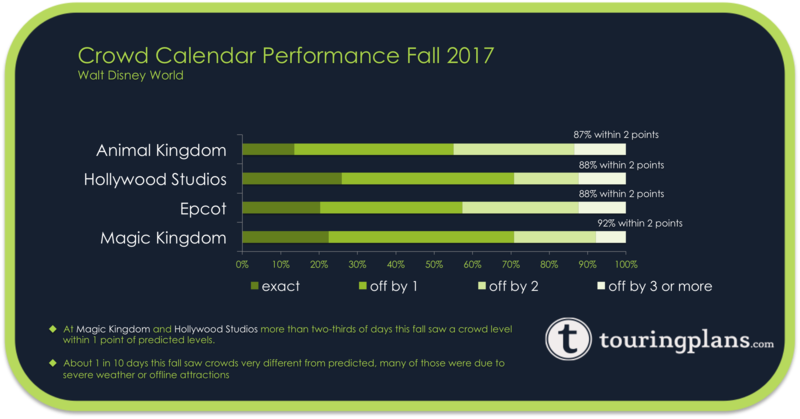 Overall, if you used the calendar during Fall 2017 the crowds you experienced were likely to be close to what the Disney World Crowd Calendar predicted. All of our Walt Disney World wait time models are refreshed with the latest information and trends. In general, the trend is longer wait times although there are some days where the crowd level will be lower. May will be an interesting month for Hollywood Studios if Toy Story Land opens up in that month. Perhaps for Memorial Day weekend? Let’s see what the 2018 Crowd Calendar looks like now month-by-month, after this update. Epcot sees some dips in crowd level throughout January while Hollywood Studios and Magic Kingdom see some increases. The month is still a great time to visit if you prefer lower crowds. Hollywood Studios sees the largest jumps in crowd level in February. Some days will see an increase of more than 2 points. Other changes in the month are relatively minor – up or down a point. Mardi Gras and Presidents Day are only 6 days apart in 2018 so watch out for the compounding effect. When these two holidays fall on adjacent weeks, crowds can be extreme. This update will bring more of the same for March. Hollywood Studios and Magic Kingdom tend to increase a bit and Epcot slides down a point on some days. Epcot’s Flower and Garden Festival begins and the end of the month brings the beginning of the Easter Season. Add in Spring Break for 20-35% of school districts and March will be busy. Easter Sunday falls on April 1 in 2018 which means the crowd calendar expects extreme crowds until April 8. Hollywood Studios and Magic Kingdom see more 10s on this update. As usual, the second half of the month will see moderate crowds. The crowd levels in May will depend on what happens with Toy Story Land’s opening date. This latest update assumes that it will open in time for Memorial Day Weekend. Once we have an official announcement the crowd levels will be updated accordingly. When it does open we expect large crowds in the short to medium term but not quite the influx that we saw for Pandora at Animal Kingdom in 2017. Still, this franchise is very popular with all ages. We saw a 15-20% increase in wait times at other Animal Kingdom lands when Pandora opened so it is possible to see something similar at The Studios. As we look toward June the crowd calendar becomes more speculative. A lot can change between now and then. However, the models are currently predicted slighter higher crowd levels for many days compared to the previous version of the calendar. Resort-wide this update sees a bump in crowd level of one point on most days in June. It always surprises us when the crowd calendar predicts a crowd level below ‘7’ on July 4 at Animal Kingdom and Hollywood Studios but year after year it proves to be accurate. This latest update puts Hollywood Studios three points higher on that day but still only has it at a ‘6’. Considering how jammed Magic Kingdom and Epcot are on July 4, Hollywood Studios is a great option. Crowd levels in August are up as well on this update however that is subject to change depending on the 2018-2019 school schedules. Watch for an update to August and beyond sometime in April. Although September has been more crowded in recent years compared to the last ten, it is still a great month to visit. It is the only month where multiple days are rated as a ‘1’. Once Labour Day passes, September has the lowest crowds of the year. You will see some increases of one index point in October as well although not as often as other months. Even though the trend of wait times is up, there are very few days where a crowd level increase by more than two points. On average, the increase is less than 1 index point. In 2018, Thanksgiving falls on November 22 which is the earliest possible day on which it can fall. That means late November will see some low crowd levels like we usually see in early December. 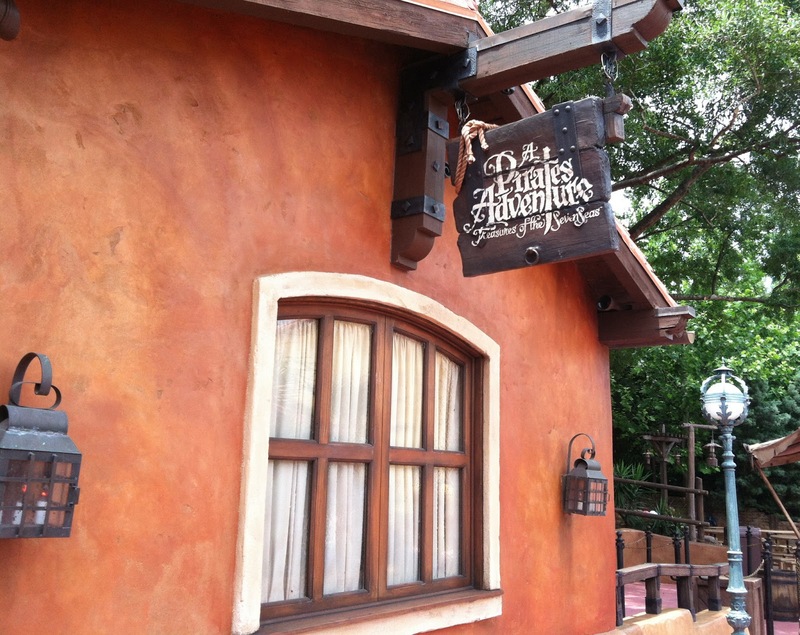 Other than some increases at The Studios, November crowd levels are relatively unchanged. December looks similar on this update too. Some days see an increase in the second half of the month while the first half is nearly unchanged. Great work guys and gals!!! Thanks for making our life easier and keeping us updated on crowds. Thanks as always for the updates. We have a trip planned May 30- June 4 – if Toy Story land is open, will and if so, when will a fast pass window open up for the Slinky Dog coaster? Is that something Disney will do the day of for brand new attractions? Do you have a strategy for a new ride based on Flights of Passage for this? I re-optimized all my custom plans for my upcoming June trip as there was a 1 or 2 point increase every days we will be there. Using the free time my original plans predicted before the nightly fireworks shows as a metric, it appears as if there is at worst 30 additional minutes of standing in line per day. That averages out to about 90 seconds per queue. I think I can live with that.